3D Reconstruction[/accordion] [accordion title=”Answer” id=”acc-4″]The non-contrast images demonstrate a well-defined round, slightly hyper-attenuated structure in the prepontine and interpeduncular cisterns. 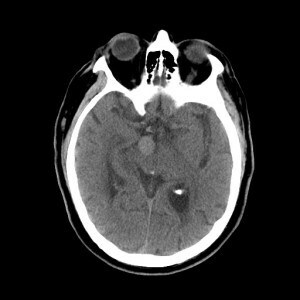 No acute haemorrhage is identified. The CT Cerebral Angiogram and 3D Reconstruction confirmed a 12 x 18mm basilar tip aneurysm. 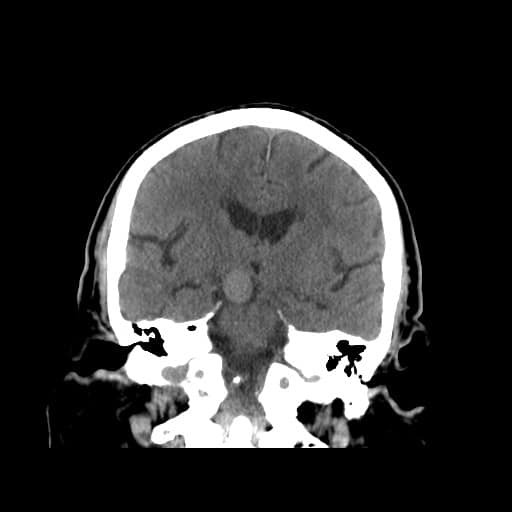 Incidentally, the left posterior cerebral artery has a fetal origin (supplied by left posterior communicating artery) – a normal variant. The patient’s signs and symptoms are of a unilateral third nerve palsy. The pupil is ‘down and out’ because of the unopposed actions of lateral rectus (CN VI – Abducens nerve) and superior oblique (CN IV – Trochlear nerve). The remainder of the extra-ocular muscles are supplied by CN III (oculomotor nerve) which is compressed by the aneurysm as it emerges from the midbrain. The patient proceeded to have elective craniotomy and clipping of the aneurysm.